Learned a lesson this week. A very important lesson for those of you out there trying to plan a week of meals to take to work without any will power. Don’t make bite-sized meals. You’ll regret it. Every time I got bored, I’d sneak downstairs, open the fridge, and pop a few of these babies in my mouth and go back to watching TV. My only saving grace? I have to walk up and down a set of stairs to get from my bedroom to the kitchen. That has to be a couple calories burned, right? All I wanted was to make some turkey buffalo meatballs, which I didn’t exactly create. Need to take another go at them, however, they did end up spicy. I ended up eating a good portion of them before work the next day. Seriously, I need help. Anyway, they came out delicious, probably would be good in a sauce or on sub roll with some melted cheese. I’ll have to try that with the next batch if they make it through my snack time. In a oven-safe sauce pan heat 1 tablespoon of olive oil. Mix together all ingredients in a bowl (except olive oil). 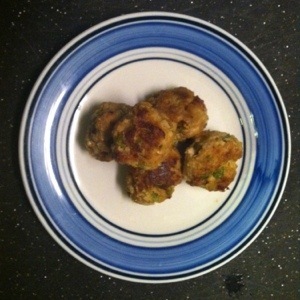 Portion out mixture into 1-inch balls and place into heated pan. Cook for five minutes, or until golden brown, turn. Cook for another five minutes. Rotate one more time and put into oven on a low broil on the middle rack. Bake for another 7-9 minutes or until meatballs are cooked through. Pull from oven and let rest on paper towels. Serve or put in fridge for later. Enjoy.